Security isn’t just another concern for Kristina Dorville; it’s her job. A proud member of the Alpha Omicron Pi chapter at George Mason University, Kristina spent her undergraduate years cultivating key workplace skills she would ultimately need to become the chief of the Cyber Education and Awareness Branch at the U.S. Department of Homeland Security. Inspired and empowered by her own experiences, Kristina began working with the Department of Homeland Security in 2003. Though she had no technical background at that time, she became interested in how increased connectivity began impacting our daily lives and affecting our country’s national security. “At this point in our society, people don’t know how to live without their mobile device and that is why awareness and education are so important,” she says. September is National Campus Safety Awareness Month, followed by National Cyber Security Awareness Month in October. “National Cyber Security Awareness Month is designed to engage and educate public and private sector partners through events and initiatives with the goal of raising awareness about cybersecurity and increasing the resiliency of the nation in the event of a cyber incident,” Kristina says. While increased connectivity can offer many conveniences and opportunities, it also can also create increased risk. Some of the most common risks are identity theft, monetary theft, stalking and cyber bullying. What is the biggest cyber concern facing collegians today? Kristina cites oversharing as a threat to all internet users. She says that the Library of Congress is currently cataloguing every Tweet as part of a social media project, and that is only one example of how what you put online is permanent. Another threat Kristina urges collegians be aware of, especially women, is the use of location services or sharing. “Cyberstalking is a serious concern for young women on college campuses. If you are regularly checking in places and pinpointing your exact location, you could be sharing with people who you may not know in real life and who may seek to do you harm,” she says. The best advice Kristina offers is to treat cyber security just as seriously as other parts of your life. “Just as you take steps every day to keep yourself safe and healthy, you need to take steps to protect yourself online,” she says. Collegians have the opportunity to engage in peer accountability when it comes to cyber safety, especially within our member organizations. “Everyone locks their doors at night, right? We all need to be sure to keep our ’digital’ doors locked as well. Just as you share your favorite new app with your friends, also remember to share your best safety tips too,” Kristina says. For more on cyber safety, visit https://www.dhs.gov/national-cyber-security-awareness-month and www.dhs.gov/stopthinkconnect. In addition check out the article in Alpha Omicron Pi’s To Dragma featuring Kristina and cyber security tips. September finds parents and families with a melancholy feeling over a summer gone and with a refocus on the school year ahead. Many of those same families will pack a car overflowing with pillows, comforters, fans and supplies as they sojourn to the campus of choice with their student. I’m a mom, and I made the journey with our two daughters for a number of years ... exhilarated for the academic year ahead, but also anxious knowing the choices and decisions they would make could impact their safety and overall well-being. For our youngest sorority members and their peers, the first 90 days on campus should be defined by orientation, engagement, intellectual challenge and making friends, but for far too many the first 90 days can be a time of vulnerability defined by uncomfortable and questionable choices, pressure to conform and potentially compromised personal safety. The month of September is designated as Campus Safety Awareness Month. Universities and colleges across the country are laser focused on the health, safety and well-being of their students, especially during those first few weeks on campus. The National Panhellenic Conference (NPC) pledges the same commitment to safety messages and resources for students through partnerships and social media campaigns to heighten awareness. The Red Zone – the first six weeks of school is when students are most at risk for sexual assault and/or violence. NPC launched a social media campaign Aug. 22 that continues through Oct. 2, providing information and tips on staying safe, bystander intervention and reporting instances of sexual violence. We also encourage you to use this resource on consent to discuss sexual assault during #TheRedZone. National Hazing Prevention Week, Sept. 19-13 – NPC has partnered with HazingPrevention.org, NALFO, NAPA, NIC, NMGC and NPHC on a positive social media campaign, #IbelieveinGreeks, about what fraternal organizations are doing and can do to prevent hazing. 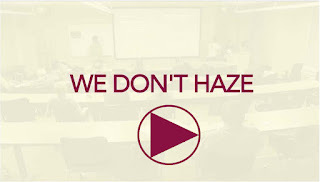 Consider watching the video below with your chapter or Panhellenic community to keep the conversation going about hazing during this week. Protection of good health is central and primary to the student experience. NPC is appreciative to our member organizations, industry and higher education partners for their collaboration in carrying the message of campus and student safety beyond the month of September. We applaud your efforts to weave the message of safety into new member programs, chapter programming and the total student campus life experience.